“Gear box changeover on Dmitry Sotnikov’s truck was done the whole night, works finished only at 5 a.m. and the truck could drive for a test. Similar situation was with Anton Shibalov’s truck, on which the coupling was changed during the night and the crew also went for a test drive only in the morning. On other trucks works finished earlier and all helped to Dima’s and Anton’s crews”, – this is how the shop manager of KAMAZ-master Team Stanislav Pogozhikh commented today’s night. Many times night mechanics performed a miracle and recovered trucks for the start, when everyone thought that things are screwed up. And today’s morning traditionally unslept mechanics sent six ready race trucks to the last start of Silk Way Rally-2018. Due to the rain, keeping up the whole night, organizers decided to shorten the special stage because of impassible frod on the 105th kilometer of the stage. So, instead of planned 191 kilometers contestants had to overcome only 80. But in rally-raids you can’t predict a result, therefore these 80 kilometers kept fans, organizers and sportsmen on tenterhooks. Martin Van Den Brink became the winner of the last piece of the race, “bringing” a minute and a half to Nikolaev, who took the second position. Sotnikov finished third – he lost two and a half minutes. Karginov showed the fifth best time, being five minutes ahead of Van Den Brink, but victory in the whole race is much more important – the first victory of Andrey in the Silk Way Rally! Already in the evening all contestants, that had passed 7 days of the most challenging special sections from Astrakhan to Moscow, were awaited at the podium in the Red Square and everyone who finished the race, despite taken positions, could get his “part” of applause and drive onto the famous finish podium of the race. Fans, partners, sponsors, friends and relatives – all came tonight to the Red Square to congratulate the winner of Silk Way Rally-2018 Andrey Karginov. Having missed a year due to the trauma, Andrey showed a firm and uncompromising fight and was justly rewarded with the golden tiger – SWR winner’s symbol. The second place and the silver tiger went to Airat Mardeev, Anton Shibalov drove third to the ceremonial finish. Young karters also came to congratulate the team with the victory. 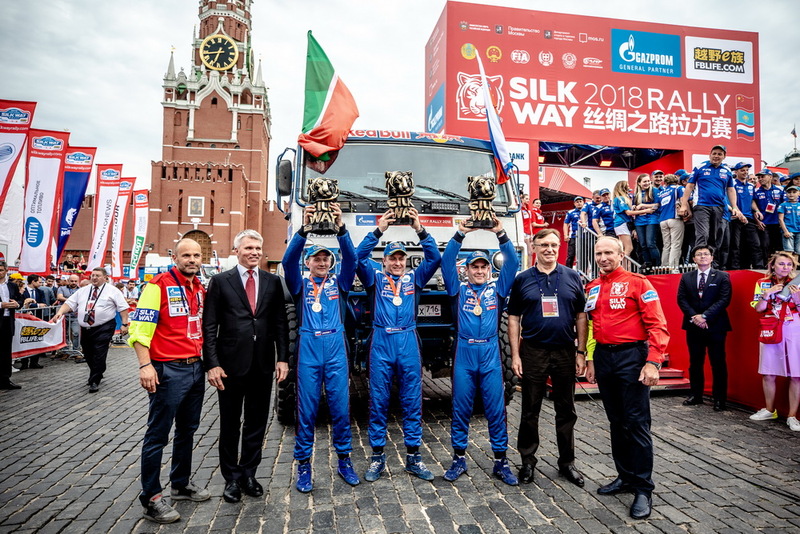 Winning the journey to the SWR finish on all-Russian karting competitions for KAMAZ-master cup, which had been held on 9 and 10 June 2018, Nikolay Shakshin took part in the award ceremony and could shake hands with winners of the Silk Way Rally. “First of all I would like to thank our partners, those who helped us to prepare our vehicles, those who are with us for a long time and those who are with us since recently. Many thanks to our partners, our fans supporting us. Without that it wouldn’t even be interesting to carry on. Special thanks to KAMAZ Publicity Traded Company, which makes trucks, which is always together with us. Many thanks to everyone! Thisweek our team had plenty of work. Race is always followed with hard work: these are night works and daytime works on the route. Crews put out all strength, put out all strength the service group that was preparing trucks for the next day. We solved many questions on this race, some need development, but main issues are clear, we will continue our preparation for Dakar”. “We are very happy that we could win. I missed a year, was out of competitions. It was very hard to watch on the sidelines at your friends, other teams, how they compete, I am a sportsman in my heart and wanted to get behind a wheel sooner. Our crew won at Dakar in 2014, at Africa Eco Race in 2017, but Silk Way Rally has always been “unconquerable top” for us, now we took it. The new truck performed very well, we are getting used to the truck, after all it is a new chassis, new engine – we have to get accustomed to the truck, what you actually can do endlessly”. “The main target for us was to test the new truck, which we just managed to assemble before our departure. To develop it into the race condition, test gear box. We already have an understanding which trucks will go to Dakar and this race helped us a lot. Unfortunately, there were technical problems on this Silk Way, which didn’t allow compete for the first position. Rivals are incredibly strong, we all know one another. I am very happy for Andrey – after a year of a break, victory in the international rally is very important for him. He had a fast pace, he recovered completely, I think on the upcoming Dakar rivals will have a tough time”. “Organizers tried to find interesting, challenging tracks. The race lasted only seven days, but the route turned out a real marathon. Feelings after the race are only positive, I can say we drove at one breath. In the beginning our target was to cover others, we drove as a fast assistance, but during the race situation has changed, and, let’s say, we were given freedom”. “It was narrow and scary on the last kilometers. Somewhere there were such cliffs on each side, that we tried to go literally “below our breath”not to do some mistakes the last day. Most of all in the race I liked that every day was absolutely different from the previous one: the place looked the same, and tracks must have been familiar but no… The same as the route, and our own state and the state of tracks. A lot was was pressed into these seven days. Most difficult was to “roll in”, feel the new truck on terrain of the central part. The main difference of our truck with gas-and diesel cycle is that it adds power when it is needed. When you need your truck to speed up, gas helps a lot. Diesel requires good rotation, spinup, here you can do the same at low rpm. The same jerk, needed at the last moment, it is what gas gives you apart from economy and ecology”. 1. Crew № 309 Karginov А. (КАМАZ-master) 25 h 26 min. 12 sec. 2. Crew № 303 Mardeev А. (КАМАZ-master) + 18 min. 02 sec. 3. Crew № 306 Shibalov А. (КАМАZ-master) + 1 h 03 min. 29 sec. 4. Crew № 311 Kuprianov S. (КАМАZ-master)+ 1 h 51 min. 29 sec. 5. Crew № 301 Nikolaev E. (КАМАZ-master) + 2 h 19 min. 14 sec. 6. Crew № 308 Sugawara Т. (HINO TEAM SUGAWARA) + 3 h 01 min. 35 sec. 7. Crew № 312 Shkyaev M. (GAZ raid Sport) + 12 h 32 min. 17 sec. 8. Crew № 317 Levitskii B. (GAZ raid Sport) + 13 h 14 min. 10 sec. 9. Crew № 314 Sugawara Yo. (HINO TEAM SUGAWARA) + 23 h 00 min. 52 sec. 10. Crew № 300 Sotnikov D. (КАМАZ-master) + 104 h 59 min. 43 sec. 11. Crew № 304 Martin Van Den Brink (MAMMOET RALLYE SPORT) + 216 h 27 min. 50 sec.